With the completion of Istanbul’s third transcontinental bridge, the Istanbul-Izmir Highway Project — the world’s fourth longest suspension bridge — plus the Eurasia and Ilgaz Mountain tunnels, 2016 was Turkey’s year of mega projects. The Ilgaz Mountain project, consisting of two tunnels — one 5,370 meters long and the other 5,391 meters long — was constructed to connect Turkey’s West Black Sea and Central Anatolia regions. The tunnel will significantly reduce traveling times on the Ilgaz Mountain motorway from 35 minutes to eight minutes, cutting the existing route by 5.4 kilometers. A 38.2 million Turkish liras ($10.9 million) saving is expected to the country’s economy annually with 8.3 million liters of fuel saved and over 345,000 hours cut from journey times. The Eurasia Tunnel, the first road tunnel constructed underneath the seabed of the Bosphorus, was opened on Dec. 20 to significantly reduce travel time between Istanbul’s Asian and European sides. The $1.3-billion tunnel, designed as a two-story structure which will be resilient to earthquakes and tsunamis, was built by the private sector through the build-operate-transfer model. Construction of the titanic infrastructure project took over four years. The total length of the project is 14.6km (nine miles) and the most crucial part, the Bosphorus crossing, is 5.4km long. Turkey launched its second military surveillance satellite — the Gokturk-1 — from the Kourou Launch Center in French Guiana on Dec. 5. The satellite put into orbit is a high-resolution optical earth observation satellite for civilian and military applications, which has a capability of scanning high-resolution images (up to 0.8 meters) and an onboard X-band digital imaging system to handle data compression, storage and downloading, according to the Turkish Armed Forces. Apart from its military applications, the satellite’s imaging capabilities could be used to monitor forest control, illegal construction, crop management and casualty assessment after natural disasters. On the 93rd anniversary of the founding of the Turkish Republic, a new station for high-speed trains in the capital Ankara was inaugurated to provide services to 50,000 passengers a day. The $235-million station, which was built in two years through the public-private partnership model, is among a set of leading infrastructure projects planned as part of a series of objectives for Turkey’s centennial in 2023. According to Turkish State Railways, the facility also boasts 134 hotel rooms and over 200 rentable areas for restaurants, coffee shops, entertainment venues, stores and offices. Istanbul’s Yavuz Sultan Selim Bridge, which cost nearly $3 billion to construct through the build-operate-transfer finance model, was opened on Aug. 26 as the world’s longest suspension rail bridge in its class. It will lead to $1.75 billion a year in savings through reduced travel times and energy costs. 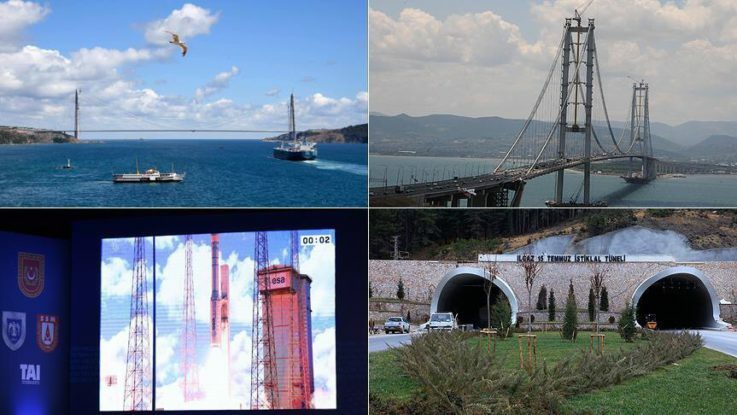 The 1.4km (0.9 mile) bridge will carry eight lanes of traffic and two rail lines between Europe and Asia at the entrance of the Bosphorus to the Black Sea when the Northern Marmara Motorway Project — the next two phases of which will see 257km (160 miles) of roads — is completed by the end of 2018. This third Bosphorus bridge was named after Selim I, the 16th century sultan known for his expansion of the Ottoman Empire. It follows the July 15 Martyrs’ Bridge — previously the Bosphorus Bridge — and the Fatih Sultan Mehmet Bridge in spanning the important waterway. A landmark road bridge over Turkey’s Marmara Sea to cut travel times between Istanbul and the country’s western provinces was opened to traffic, forming part of a new six-lane Istanbul-Izmir highway which cost around $6.3 billion. The $1.3-billion earthquake-resistant Osmangazi Bridge, a 2,682-meter structure, was named after Osman Gazi, the founder and first sultan of the Ottoman Empire. The 421km (261.6-mile) highway project is being built through a public-private partnership as the first road project in the country to be procured under the build-operate-transfer model. It will eventually cut the average journey time between the Aegean coastal province of Izmir and Istanbul (480km apart) from 10 hours to approximately four. Kenan Sofuoglu, a world-renowned Turkish motorcycle racer, broke a racing record on the bridge prior to the inauguration ceremony, managing to hit the 400km (248.5 miles) per hour mark on his sports bike within 30 seconds.